Craving lasagna but don’t want to take hours to make dinner? 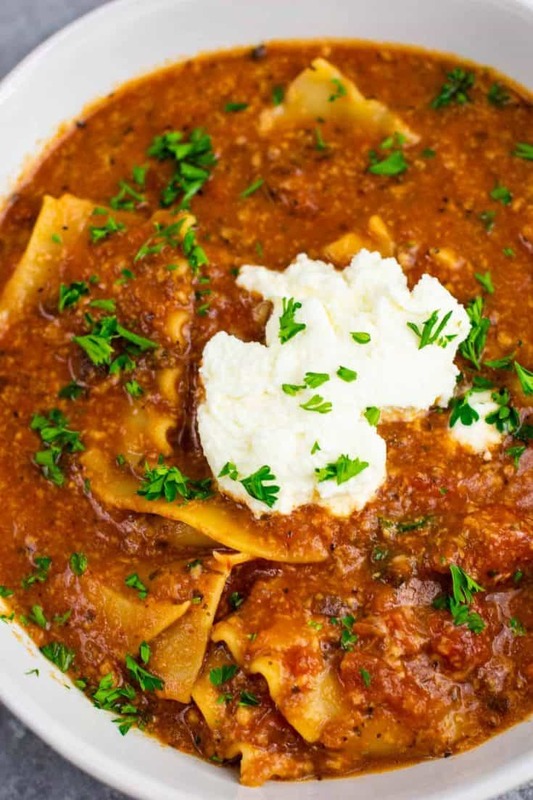 Lasagna soup to the rescue! 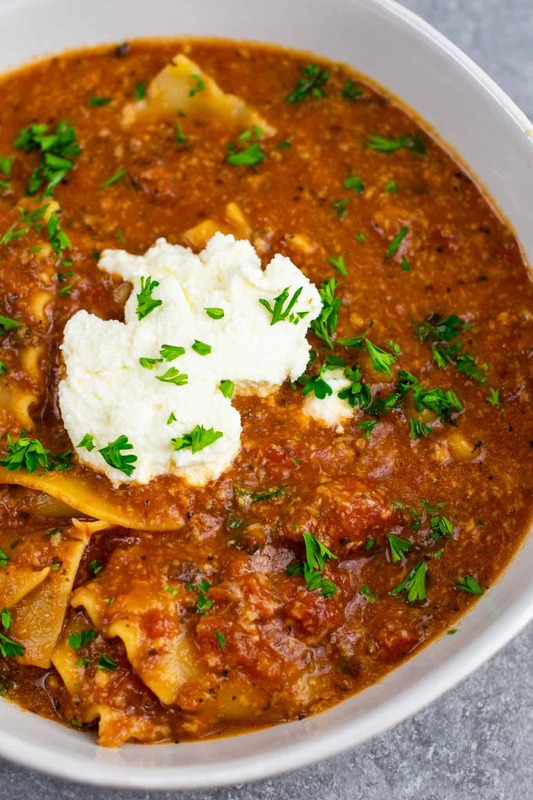 This easy lasagna soup is ready in just 30 minutes and tastes like your favorite lasagna. Perfect for busy nights! Everything cooks in just one dish (even the noodles), and comes together in just 30 minutes. 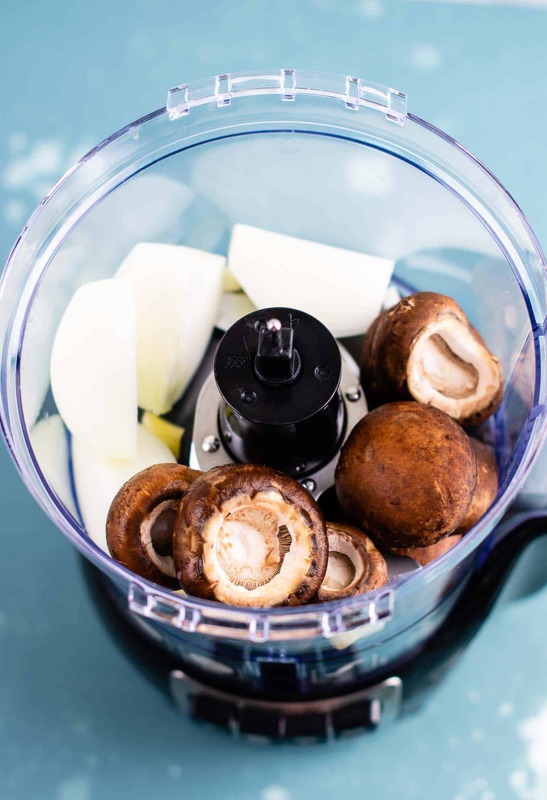 First, start by adding your mushrooms, garlic, and onion to a food processor. Process the veggies until they are fine minced texture as seen in the next picture. These veggies will give the sauce a “meaty” thickness similar to how I make my incredible vegetable bolognese sauce. Mushrooms are great for adding a meatiness to vegetarian dinners! Heat olive oil over medium high heat in a dutch oven or large pot. Add your veggies and cook for around 10 minutes, until most of the liquid evaporates. Once you cook the mushroom/onion/garlic mixture, you will add the pasta sauce, tomatoes, vegetable broth, and a few spices and bring it all to a boil. 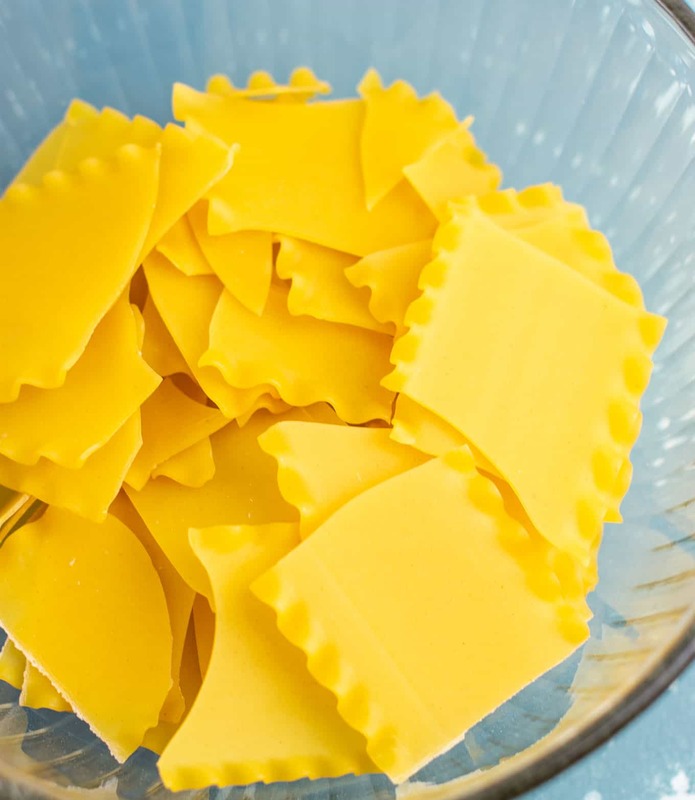 Once boiling, add in your broken up lasagna noodles and cook until al dente. This should take around 10 – 12 minutes. 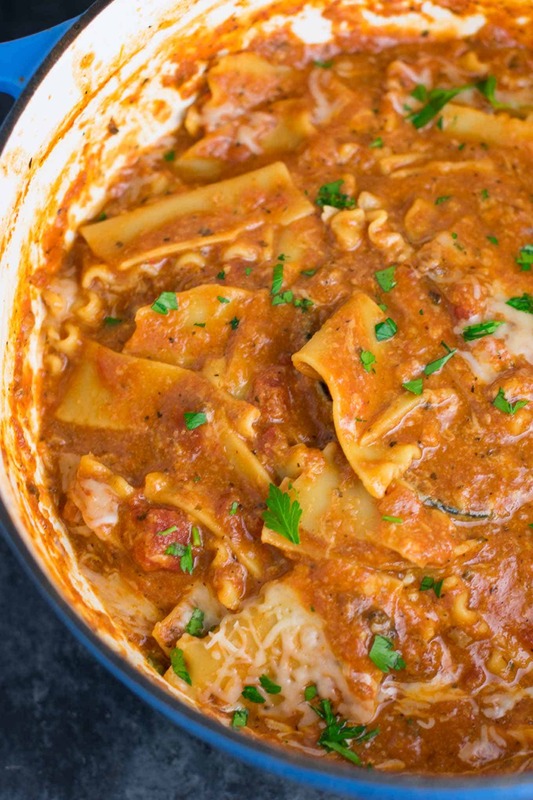 I like my lasagna soup nice and thick and “meaty”, so this sauce is super thick. If you want more noodles to sauce ratio, you can also add in more lasagna noodles to your liking. You really can’t go wrong with this dish! Serve in big bowls and garnish with ricotta cheese and parsley. Once you stir the ricotta it will look like a beautiful rosy cream sauce. So creamy, cheesy and filling. 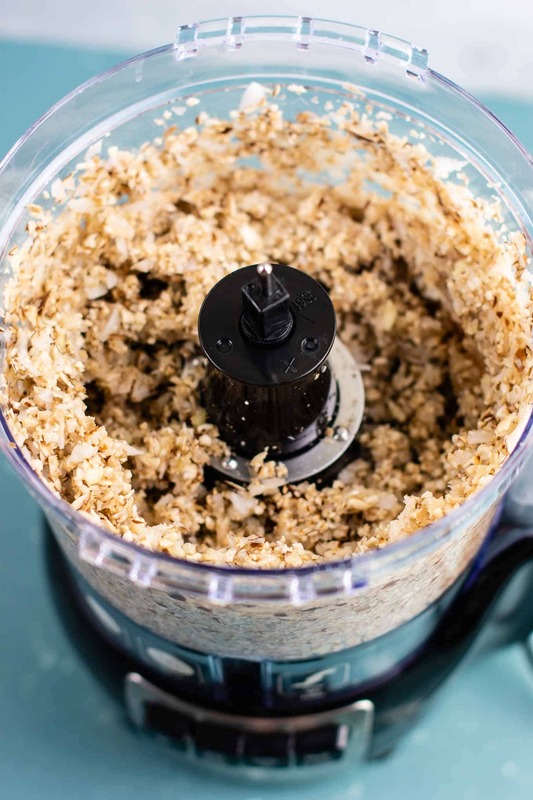 We had this leftover the next day and it thickens up even more overnight but I loved it. 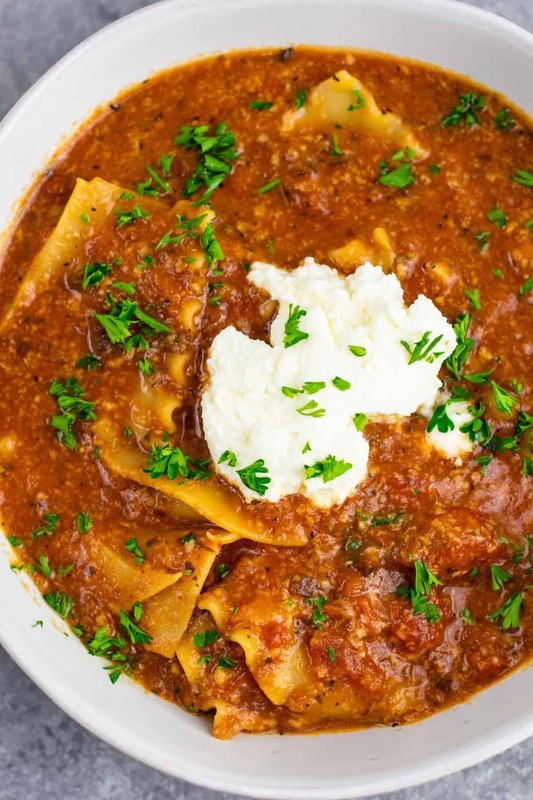 If you love lasagna, you will love this soup! Hungry for more vegetarian pasta recipes? Here are some of my favorite easy meatless pasta recipes! 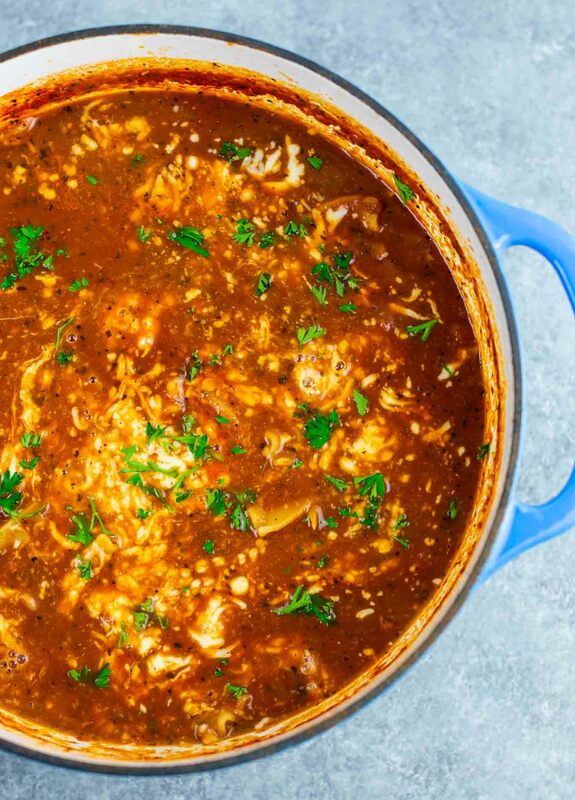 This easy one pot lasagna soup recipe is a delicious vegetarian dinner that is ready in less than 30 minutes from start to finish! Delicious! The fresh parsley really makes a difference! It’s officially on my list of regulars to make. I served this along with a grilled cheese sandwich 🙂 thanks for sharing this recipe! Sounds delicious! So glad you enjoyed the recipe! Did a google search for “best vegetarian recipes” and this came up. Made it tonight for dinner… SO good! Turned out perfect. Quick, easy, and delicious! Can’t wait to try more of your recipes! Thanks! Made this for my VERY picky, lactose and vegetarian intolerant fiancé. I left out the cheese and just added it to my bowl. He loved it!! Thank you for being our first successful vegetarian recipe! I am so glad you enjoyed the recipe, thanks for sharing!